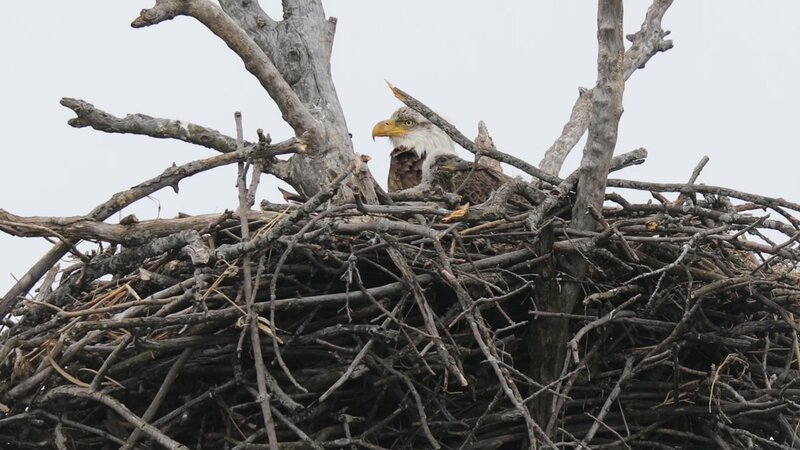 When I visited this nest back in March for a story about bald eagles returning to Cook County, my guides – Josh Engel from the Field Museum, Chris Anchor, chief biologist at the Cook County Forest Preserve and photographer Josh Feeney – all agreed that the mother appeared to be sitting on at least one egg. Feeney, who makes his living as a realtor but is a passionate naturalist, has gone regularly to Busse Woods since then to keep an eye on the growing family. On Friday he was eager to send me this video – the mother standing guard while the baby clumsily rises up and stretches its wings. Anchor says he saw two eaglets in the nest soon after they were born, but since then only one has been visible. One possible explanation, says Anchor, is the somewhat common practice of fratricide, even among cute eagle babies. Anchor also mentioned that this nest is one of five active nests known in Cook County. Three have visible eaglets and the other two have females sitting tight, he says, either still on eggs or brooding chicks. Anchor says this is the best year he is aware of since bald eagles first returned to breeding in Cook County roughly seven or eight years ago. And that, he emphasized, was after an absence of more than 100 years. Feeney promises to keep us apprised of the news from Busse Woods. March 23: In the early 1960s, bald eagles were nearly extinct in the lower 48 states. But government protections and conservation measures have had a huge impact on their numbers. “I think it’s an incredible success story,” said biologist Chris Anchor. March 15: After 20 years in the fashion industry, Owen Deutsch wasn’t planning on getting back into photography. But then he discovered a new subject: birds.